I developed the following painting instructions after years of painting experience. I painted professionally for Musket Miniatures for many years. I painted all the castings used in the catalog photographs for this website using these techniques, so you should get similar results! The following shows me using the painting sequence that I describe below on an actual casting. It is important to realize that the quality of the finished painted product will reflect the quality of paints and brushes that you use. DO not use cheap, low quality brushes and paints, or your investment in Mark IV Miniature’s products will not be maximized! 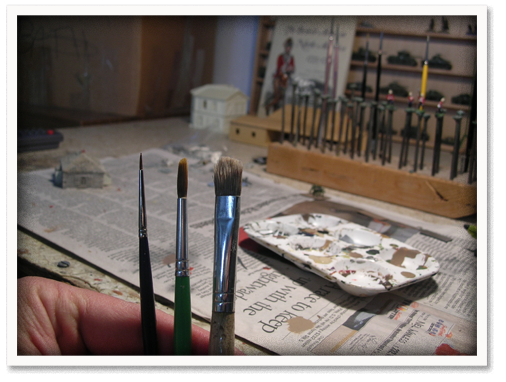 I use high quality red sable paint brushes, and I use Musket Miniatures, Ceramcoat, and Apple Barrel acrylic paints. Ceramcoat and Apple Barrel acrylic paints are available at hobby retail stores like Michael’s and Hobby Lobby. Ceramcoat and Apple Barrel are good paints, but they must often be diluted with some water for best coverage. The first step in producing an eye-catching paint job is to prepare the casting properly. Use a hobby knife to remove any extra plastic resin that remains after the casting process. Then wash the castings in warm water with mild dish detergent added to it. Rinse the castings and allow them to completely air dry. When the castings are dry, prime them with spray paint. I prefer flat black spray paint because it gives depth to the recesses of the castings, and gives a greater three-dimensional effect to the paint scheme. Prime the castings with several light coats of spray paint, rather than one heavy coat. Start painting the exterior walls of the buildings first. Use a medium-round brush and just cover the walls. Do not worry about perfect coverage. Just focus on covering the walls and roof. You may need to use a second coat of paint to make the coverage more even. Next, mix silver and a little bit of blue to get a shiny color for the window pains. Paint all the window panes, and do not worry about getting paint on the wood trim between the pains. Next, paint any groundwork around the base of the building. 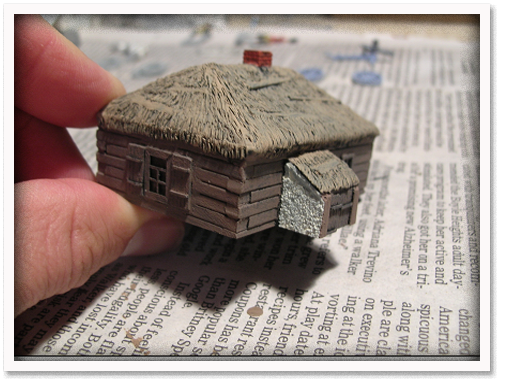 Many of Mark IV Miniature’s buildings and most terrain pieces have groundwork bases, so buy or mix up a large quantity of a suitable groundwork color. This way you can use the same paint for all your groundwork. This will make all your terrain groundwork look consistent. When you have painted the groundwork, go back and paint the exterior and interior details like window trim, shutters, chimneys, and wooden framing. The best way to paint many wall-mounted features is to paint the sides of the features (wooden framing shutters, etc.) when you paint the walls. Then it is easier to get neat coverage by only painting the fronts of the shutters, window frames, and other wall details. This takes a bit of practice, but when you get the hang of it, the effect is stunning. After all the casting is painted, it is time to weather and detail it. 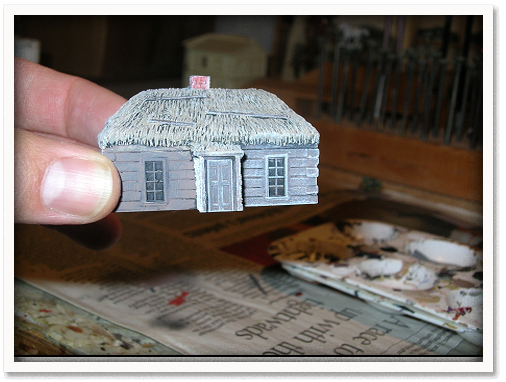 First, paint any small details like door hinges, door knobs, interior fireplaces, etc. Next, weather the casting. 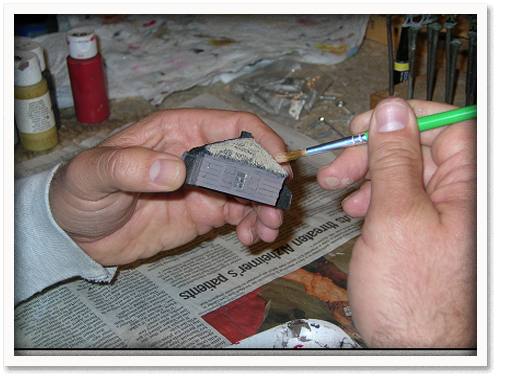 This step highlights all the details of the casting, and “brings it to life!” Use a paint brush with stiff, flat-ended bristles. The best brushes for weathering have stiff bristles that are about ¾” wide. Use a “drybrushing” technique to weather the casting. Drybush light gray onto the casting first. Dip the ¾ “ wide brush in a SMALL amount of light gray paint, and thoroughly wipe most of the paint off the brush onto a paper towel. When you can’t see any more paint coming off the brush, start lightly brushing across the raised details of the casting. When you have sufficiently wiped most of the paint off the brush, then the raised details will catch minute amounts of paint, and you will immediately see a weathered effect on the casting. Apply the light gray onto the entire model. Next, do the same drybrushing technique with a sand color, especially at the bottom edges of buildings. Imagine where on the casting it would be likely to be dusty, and focus the sand color on those areas. Finally, drybrush black onto chimneys or areas of damage on the battle-damaged castings. This will make a smoky effect that accentuates shell blast areas on the battle-damaged buildings. This technique takes a bit of practice, but it makes the castings look real! You can also weather the casting using the airbrush. An airbrush is a fantastic way to create the smoke effects on battle-damaged buildings. Use flat black, and lightly spray onto the edges of damaged areas, and onto pock marks on the walls and roofs. Another great weathering technique is to use a wash on the walls and roof. Mix a couple drops of flat black, brown, and dark blue together, and add about 8 parts water to 1 part paint. The blue sounds weird, but try it once and you will always add it in the future! 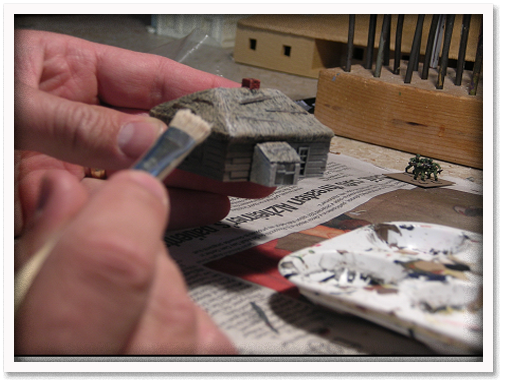 Lightly apply the wash to the exterior of the entire model after it is weathered. The wash is subtle, but it adds tremendous realism, especially on the roof. It looks like water staining, and gravity automatically makes the wash flow and concentrate onto the areas where real water would collect. Allow the wash to thoroughly air dry. The final step is to protect your new paint job from gaming damage! Use a high-quality protectant, or your paint will eventually chip off of areas that get high amounts of use. 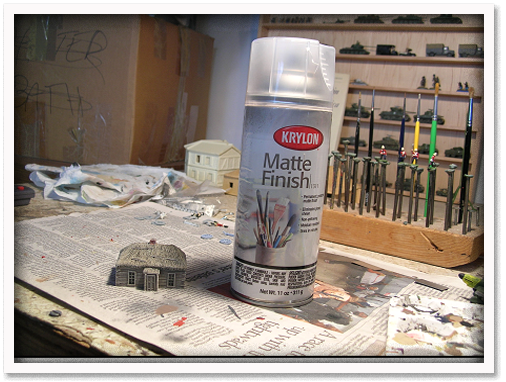 The best protectant is Krylon Matte Finish, #1311. This is an aerosol spray, and it is fantastic! Matte finish produces a beautiful sheen that is not glossy, and is not ultra flat. Krylon paints are available at Michaels, Wal-Mart, Hobby Lobby, Home Depot, and Lowe’s. If you practice the above techniques, you will get great results! Just remember…if you mess up, just paint it again! 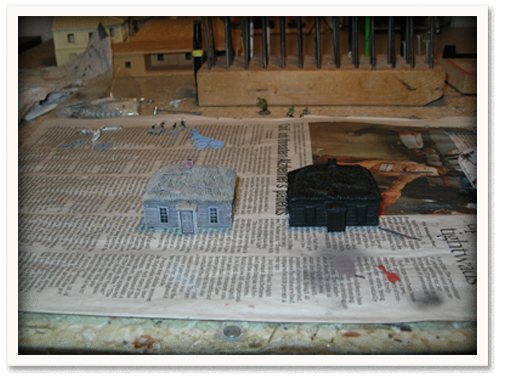 The photo below shows the finished casting in use on my game table. 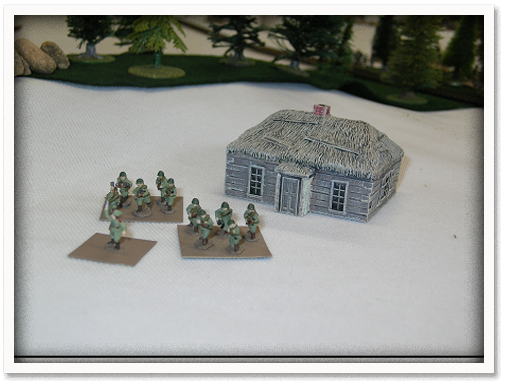 The casting is TEF1000 10mm Orel House shown with Minifigs N-scale Russian Infantry.